Posted by Sara MacLennan on Tuesday, January 20th, 2015 at 4:53pm. 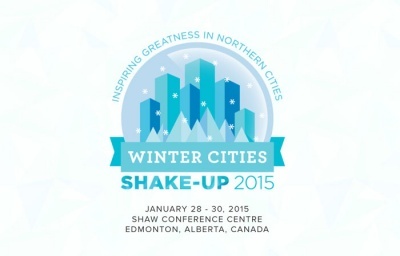 From January 28 through January 30, 2015, industry leaders and professionals from all aspects of urban planning and general business will gather together at the Shaw Conference Centre for the popular Winter Cities Shake-Up 2015 conference. This is an event that is designed to add some excitement to the doldrums of the winter season, and it is designed to explore new ideas and creative approaches to city planning on a broad scale as well as localized business efforts. Whether you are an entrepreneur, an urban designer or even a local artist or cultural performer, you may have ideas and plans for the city that you want to share, and this is the place to go to get your ideas heard. When you attend the Winter Cities Shake-Up 2015 conference, you will be able to network with a wide range of attendees and make some fabulous relationships. While you can share your own ideas for city planning with others, you can also attend special events that feature speeches and presentations from top business leaders. You may also be able to speak with these business leaders in person. Some of the individuals who are scheduled to speak at this event include Jeff Freed from Life Below Zero, Mayor Esko Lotvonen, Reza Nasseri from Landmark Building Group, Veronika Scott from The Empowerment Plan, Jani Koskeli of the City of Kemi and many other politicians and business leaders. Of course, you cannot fully understand and appreciate ideas about city planning and business opportunities without getting out of the event center and exploring the city in detail. This is a special event that features field trips and other plans that take you outside of the event center. There are a total of nine field trips planned for the event, and these will take you on biking adventures, city planning exploratory trips, winter festivals and more. The good news is that the cost of attendance on these field trips is included in your attendance fee for the event. If you believe that you would benefit from attending this enlightening and exciting event, you do not want to miss out on the chance to attend due to a full venue. Registration is now open. While live registration in person is available at the Shaw Conference Centre each day of the event, the fact is that you can guarantee your entry to the events and features that you are most interested in when you register and reserve your space today. The fact is that the future of Edmonton is important to everyone from artists to financial institutions, and the Winter Cities Shake-Up 2015 is the perfect way to learn more about plans and ideas that are in place for the city's future. This is a fun, lively event that brings together a wide range of people, and it will certainly be a highlight of your winter in Edmonton.